Since 1995 we have worked diligently to expand our magazine's reach and influence beyond its original target, the USA. Today, Webtrends gives us a daily picture of who is reading our articles worldwide, where they live- and which topics they prefer.The results on the left sidebar are surprising and encouraging. I did not know it at the time, but I laid the foundation for the Africa Travel and Nature Library years ago when I helped my government clients sell a warehouse full of books that were gathering dust by marketing them under the banner of a Nature Library. More revelations to follow . Our magazine's involvement in Europe at ITB Berlin and Salon de Tourisme, Paris, plus several weeks in Egypt and 6 months i n Morocco has given Africa Travel Magazine's long-range plans a giant leap forward. Essaouira, formerly Mogador, is an ideal place to relax, focus on the truly important things in life and establish some achievable goals. Our mission reflects a statement by President Kikwete of Tanzania: "The western media needs to focus more on success stories in Africa. We are doing so many good things out here which do not get enough publicity. Our editorial team takes those words to heart, as you will discover in Faces of Africa and our World Editions. We first met Sandy Dhuyvetter (left), founder of Travel Talk Radio, during an ATA Symposium in Angola, and the bonds have grown stronger ever since. I appreciate the work of other professionals and Sandy fills the bill in every way. Her interview gave me an opportunity to tell the world more about our Africa Travel Library. As a fitting followup to my interview from Morocco, one of Sandy's next interviews features my friend Rick Antonson, on his new book,To Timbuktu for a Haircut. While in West Africa for the book, Rick became dedicated to preserving the ancient manuscripts which contain valuable information about the important era when Timbuktu was in its glory. In addition to being a great author, Rick is CEO" of Tourism Vancouver and looking ahead to hosting the 2010 Winter Olympics. We'll be there! 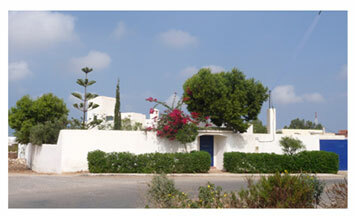 The Moroccan Mode: Since arriving in Morocco, we've driven the Atlantic Coast from Agar in the South, via Safi, Al Jadida and Casablanca to Rabat and beyond. On July 14th, the Consul General of France invited us to the annual Fête de la Fédération (Bastile Day) in Marrakech. We are living in a riad, similar to those classic North African homes and boutique hotels we love to explore and write about. At the moment we are developing a shady walled retreat, with fruit trees, flowers, birds and fish ponds. The roof terrace has a view of the new world class golf course now underway - confounding local skeptics who said it could not be done. Speaking of Train Travel. We have made several trips back and forth between Casablanca and Marrakech recently, and not only do they have sparkling new railway stations the rails are integrated seamlessly with other modes of travel, including a line to Casablanca's Mohammed V International Airport. Now underway at Rabat is a modern rapid rail line to its sister city of Salé, which alone has a population of over 900,000. A prime example for other African cities, whose mayors and executives we met at the UN Urban Forum. Like the country's railway network, the highways system is outstanding, with an ever-expanding autoroute. Toby, the trusty watchdog at our Moroccan villa, was born in Paris, where I first met him in 2002. At a dog's age that's well into the 80s, the 'Tobester' has not slowed down a peg. A natural born guardian, his bark is a welcome sound, even after midnight. A Parisian gendarme couldn't do better. Toby's online 'alerts' on our home page cover items of interest, from food and drink to web trends and search results. Read "Googled us lately" at the end of this blog. During 14 years as publishers, we've laid the foundation for The Africa Travel Library. It is based on a project I initiated in 1975, when my advertising agency was an adviser to the Alberta Government. At the Queen's Printer, I discovered a large inventory of unsold books gathering dust in the warehouse,. They bore titles such as "Birds of Alberta," "Wildflowers of Alberta," "Mammals of Alberta," "Freshwater Fish of Alberta," etc. Seizing the moment, I grouped these books under the banner of "The Alberta Nature Library." We designed Counter Top Displays for every branch of a major bank, giving the books instant mass recognition at prestige, province-wide locations. What's more - instead of the usual single unit sales, the library concept created multiple purchases. Folks wanted to own the complete set, and the program was a sellout. We expect The Africa Travel Library to be equally successful. Green Editions are in Electronic format. They require no paper and can be updated daily, even hourly. Readers can print any edition free - ideal for travel agents, tour operators and government ministries handouts for trade shows or meetings. I may have been one of the original 'Green Editors,' since my original company was an award winning producer of audio visual books, learning resources and training manuals. There's no shortage of viewers, as our website has peaked at over 1.7 million hits per month - and receives visits from around the world. The left sidebar shows the top 34 countries visiting our site and the top 34 African countries - another indication of our popularity. We are consistently #1 on Google for many Africa marketing topics. Gold Editions are printed magazines with a five year shelf life or longer. I call them keepers! Such magazines have an effective life far beyond the usual day, week or month of most print media. National Geographic is an ideal role model - still a good read after many decades. Readers Digest has similar immortality. Most Gold Editions begin life as Green Editions and turn gold after being exposed and tested online for six months or more. We schedule the launch of a Gold Edition to coincide major travel shows, as we did for ITB Berlin and Salon International de Tourisme in Paris. "We seek permanence in whatever we do. Most magazine issues are so temporary. Why cut down a forest to feed the needs of a newspaper or large magazine. We aim for maximum shelf life and the capacity to reissue with updates. I love trees! I hate unnecessary waste. " A 64 page event guide, preview and post event review of global activities in support of Africa Travel, Trade and Tourism. Events profiled range from ITB Berlin, World Travel Market, UK and New York Times Travel Show, to Africa-based events, such as Indaba, Karibu Fair and AT Annual Congress. The Venues World Edition will showcase recommended events in depth, providing background, current and future dates, plus details regarding host cities, transportation and hotels. We exhibit at most of the dozens of events our editors attend. Download 60 page sample. Custom Venues Editions will be created on demand for certain major events. For example, we produced and circulated a special issue when Zanzibar hosted the Southern Africa Development Community (SADC).
. Northern Africa:. Algeria, Egypt, Libya, Morocco, Sudan, Tunisia, Western Sahara.
. Botswana, Lesotho, Namibia, South Africa, Swaziland.
. Eastern Africa: Burundi, Comoros, Djibouti, Eritrea, Ethiopia, Kenya, Madagascar, Malawi, Mauritius, Mayotte, Mozambique, Réunion, Rwanda, Seychelles, Somalia, Uganda, Tanzania, Zambia, Zimbabwe.
. Western Africa: . Benin, Burkina Faso, Cape Verde, Côte d'Ivoire, Ghana, Guinea, Guinea-Bissau, Liberia, Mali, Mauritania, Niger, Nigeria, Saint Helena, Senegal, Sierra Leone, The Gambia, Togo.
. Central Africa: . Angola, Cameroon, Central African Republic, Chad, Congo, Congo (D.R. ), Equatorial Guinea, Gabon, Sao Tome & Principe. Each Destination Edition of Africa Travel Magazine at our Vancouver Warehouse is part of the library, and this archive includes: Angola, Benin, Cameroon (2 volumes), Ethiopia (2 volumes), Ghana, Guinea, Kenya, Morocco, Namibia, Nigeria, South Africa, Tanzania, Uganda, Zambia and Zanzibar. These editions will be updated, expanded, enhanced and reprinted as requested or required. 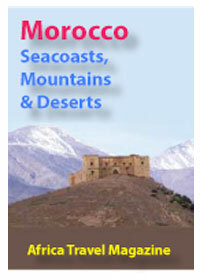  Zanzibar Archelago and Swahili Coast.
. Morocco, SeaCoasts, Mountains and Desert.  The African Diaspora - Contacts, Links and Opportunities. Evolution 1: I love a challenge - the bigger the better! My career has gone through evolution and revolution as the tools of technology changed with the times. My first efforts were Audio Visual Books and Learning Resources, several of which won awards for Creative Excellence at the U.S. Industrial Film Festival in Chicago. Evolution 2: One of my pet projects included "Supermaps" of Highways, Sea Lanes, Railway and Airline Routes, sponsored by Transport Canada, Best Western Hotels, Avis Rent A Car and others, with print runs of up to 150,000. This effort gave birth to Air Highways Magazine, distributed through airports and regional airlines. Evolution 3. On joining Travel Trade Canada Magazine in 1989, I made a vow every any edition I initiated would be a "keeper, " and with this in mind I developed a series called "Railways of the World." To kick start the project, I wrote and faxed every known railway - and achieved a bonanza, of response. Many travel agents saved every issue. Evolution 4: When the Africa Travel Association approached me in 1995 with an offer to launch Africa Travel Magazine, I kept my promise that each issue would be a "keeper." Our magazine editions are in demand at every event we attend, five or more years or more following publication.  We have appeared at events in the Vancouver and Seattle area at every opportunity, from the IATA Airport Managers Convention to Hotel Conferences and Cruise Expos. Every two years, like clockwork we attend Globe International - the world's largest Enviro Business Expo. When the Adventure Travel World Summit was held in Whistler, British Columbia, north of Vancouver, we joined ATTA at one of the best networking opportunities ever.  Out of Africa-Houston, Texas. Our editors joined Hon. Tadelech Delacho and delegation at the International Festival for an exciting two weekend event. It was the launch pad for our Ethiopia Millennium edition, distributed via Ethiopian Airlines, City of Addis Ababa Tourism and the Ethiopian Tour Operators Association booth, with whom we shared exhibit space. We plan a return to Ethiopia this year to visit the country's Western sector. This category also includes African Tourist Boards, as well as equivalent organizations at the state, provincial and municipal level. We may involve related ministries, such as transportation, trade, education and finance as well as African overseas embassies. "We have received valuable support from all African Tourism Ministries and expect these partnerships to be even more vital due to the scope and importance of the Africa Travel Library in its capacity as an educator, goodwill ambassador and universal marketing force." Our partnership with the Africa Travel Association began in 1995, when we were approached to launch Africa Travel Magazine. We have won several awards , covered every AT Congress and Symposium in Africa and expect this solid relationship to continue and to prosper through the Africa Travel Library. We have many common interests with Sandy Dhuyvetter and company in promoting responsible travel and tourism. We will continue to support each other at every opportunity.  Karen Hoffman. Has had her finger on the pulse of Africa for two decades.  Muguette Goufrani (left) - Bilingual, Africa born. Muguette has lived in more African countries than any other editor or writer we know. She plans to spend the greater part of her time in Africa and is currently living in Essaouira, Morocco and Vancouver, BC, Canada.  Jerry W. Bird. I am still challenged by and thrive on big ideas. This is the biggest and most exciting ever! We have been supported by other dedicated professionals from around the world, such as Professor Wolfgang Thome of Uganda, Authors Rick Antonson and Habeeb Salloum of Canada, Ogo Sow of Atlanta, Sarah Graham Mann of New England and others whom we expect to play key roles in providing content and guidance for the Africa Travel Library . We are seeking volunteers as contributors, translators, fund raisers and area representatives. World Travel Market, UK. This outstanding event will feature prominently in our Venues World Editions as it attracts a large contingent of exhibitors and participants from Africa. 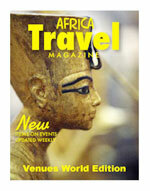 In a search for "Advertising Africa Travel, Trade and Tourism to America" our magazine's website ranked #1 and 2. Keeping such success in the family, Air Highways, our second online magazine website, ranked #3 and 4 in the same search. These consistently high scores indicate the success of Africa Travel Magazine's " Green and Gold" - electronic and print media combination . These are the building blocks of the Africa Travel Library. According to H. E. President Kikwete of Tanzania, "The western media needs to focus more on success stories in Africa. We are doing so many good things out here which do not get enough publicity." That's where Africa Travel Magazine stands out! We're foremost in delivering "positive news" as voice of the Africa Travel Association, which has staged world class events in 33 African cities since 1976. In addition, our ATA President and many board members are African Tourism Ministers. Others represent airlines, hotels, tour companies, media and educators. Since many of today's tuned in, turned on professionals get their news, views and background information via the Internet, our website employs certain facets of North America's top print media; the eye appeal of Conde Nast; the life span of National Geographic and the variety of Readers Digest. The visitor's attention is further riveted by a wealth of cultural, wildlife and nature photography, plus scenes of Africans in action at events worldwide. We provide hundreds of great images - and each gallery page is linked to a specific country or region.